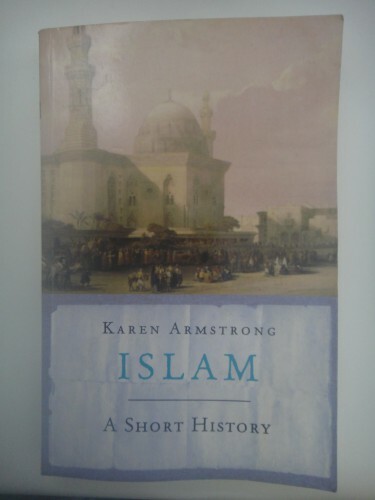 Karen Armstrong is something of an icon among religious historians. She’s written a truckload of accessible books on religion and everything God-related and, in particular, about the three major monotheistic religions: Judaism, Christianity and Islam. Armstrong is a former Catholic nun and an Oxford scholar As of 2009, Armstrong unveiled a Charter for Compassion and is currently promoting compassion in a world she believes sorely needs it. Islam: A Short History, is a short history of Islam (that was easy). It chronicles it’s founding in the late 500s by Muhammad, through the Ottoman empire and the Mongols and all the way to it’s modern incarnations. 1400 years worth is history is covered in about 150 pages, so Islam: A Short History is highly abridged. Yet, to it’s credit, very little is left out even if the details are skimpy. The book provides a neat summary of Muhammad’s era (which could have been longer), and where it really excels is in Islam’s development. It provides explanations as to where and how the various sects, practices and philosophies of the religion arose, as well as how Islam spread through different parts of the world. Armstrong tells a story, capturing the tensions and the motivations of the different groups in a sympathetic fashion. For the most impart, Islam: A Short History is an interesting web of human relations and divergent developments, but there is a tendency towards the end of the book for the storytelling to devolve into a mishmash of miscellaneous facts and names. To be fair, after around 1400 A.D., there are so many different Islamic countries and sects that it’s an incredible feat on Armstrong’s part just to keep up. Of course, in historical accounts, there’s always the question of historical bias. More specifically: what kind of bias does Armstrong write with? There’s a definite sense of awe and appreciation on her part. She’s focuses on cultural development and the way the religion grew with changing culture and vice versa. She even remarks Islam was necessary for the intellectual and cultural development of the Arabs. She also admires Muhammad and seems bent on pushing his religious and secular achievements into the spotlight of Western appreciation. For the most part she does present a sympathetic view but at times, she can become apologetic, particularly when she’s discussing the extremist factions who show up later on. Islam: A Short History is a crash course on Islam that contains more historic detail than the above-average Muslim knows, and great insights into the development of religion itself. Islam, like many religions, exists, and has existed, in a myriad of forms: Sunni, Shia, Salafi, Sufi, Faylasuf etc. each with further sub-categories. Karen’s interpretation of this is simple but profound. She argues that all religions must adapt over time to stay relevant to a changing world. But as they do, they deviate further away from their original ideal. In response to this, new groups arise to return the religion back to its roots. But in a changed world, these groups end up creating new movements entirely, accelerating the deviations even further. Left me thinking for quite a while. I think she may be right.